18 Tips for Surviving a Day at Universal Studios Orlando - Top Ten Travel Blog | Our experiences traveling throughout the US. 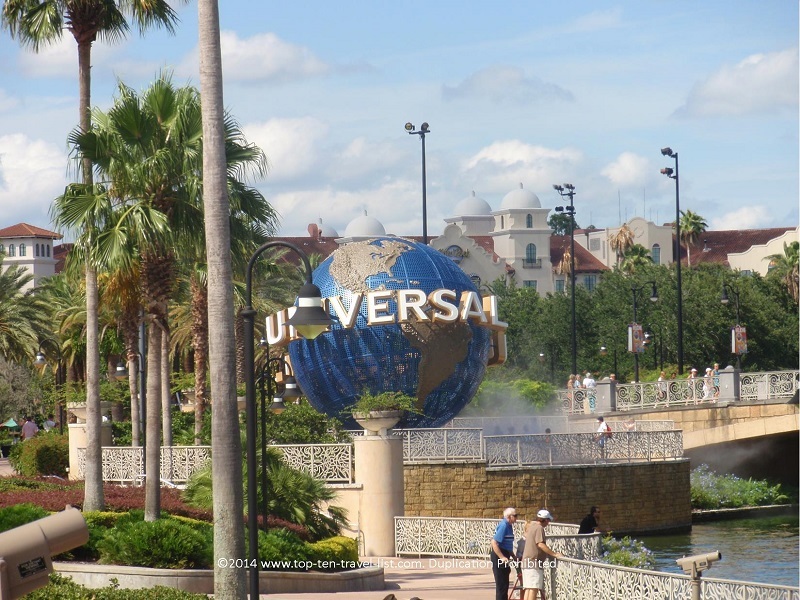 A trip to Orlando would not be complete without planning at least a day or 2 at Universal Studios & Islands of Adventure, 2 of the world’s best theme parks. I would even say that Universal is just as fun as Disney. Being well prepared can make all the difference between a great vs. miserable park experience. Visiting during the summer months requires even more pre-trip planning & organization due to the intense crowds and hot, humid conditions. 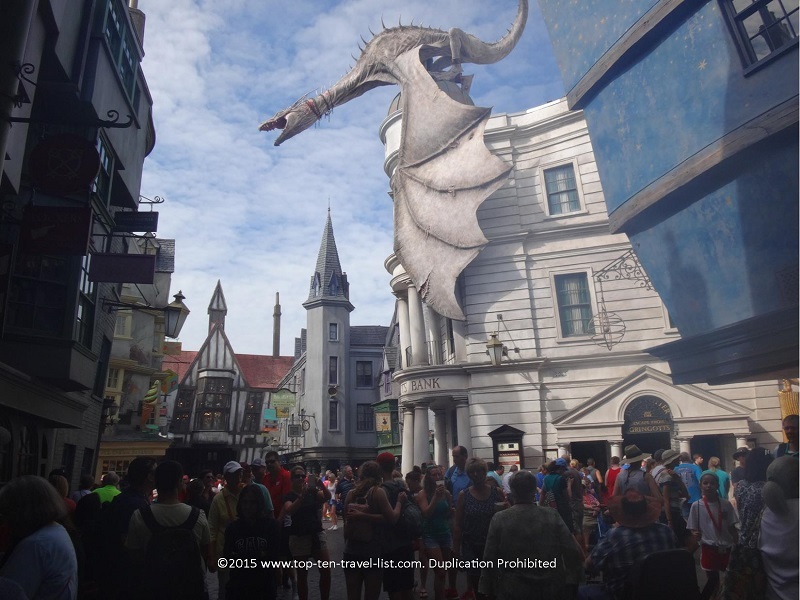 Every new visit to Universal brings forth new ideas on how to make the next visit a smoother, less stressful experience. I have come up with a list of 18 helpful tips to make your day at Universal more enjoyable. Hopefully, following the advice posted below will make you more comfortable, save you some time & money, and allow you to focus all your energy on rides and entertainment! After all, you are spending a lot of money to visit the park. You are going to want to devote all your attention towards enjoying as many rides and seeing as many attractions as possible. Enjoy the list and feel free to add some suggestions of your own! You are going to need a lot of water, especially if visiting during the hot season. Not only will a Hydration Backpack save you a lot of cash (water bottles run about $3 a piece inside the park), you will also save some time by avoiding the hassle of searching around for restaurant stands and waiting in long lines for water. These handy backpacks, known as camel baks, hold anywhere from 1 to several gallons of water so you should be good for the majority of the day. These backpacks really come in handy while waiting in long ride lines. As an added bonus, you can store other essentials like sunblock and snacks in the extra pockets. And asides from your Orlando trip, you can use them for regular activities like hiking, running, and biking, so you are not wasting money on a one-time need. Universal Orlando’s fantastic free app allows you to conveniently look up wait times for all rides within both parks. This allows you to save some time by planning your next move based on current wait times. Times are updated consistently and seem to be pretty accurate. Those limited on time especially need this app to strategically plan their day. Download the Universal Wait Times App. Both Universal Studios and Islands of Adventure offer a great selection of rides. Both parks are worthy of at least a full day visit. There are so many great rides and attractions spread out between both parks. Plus, you will need to purchase this option if you intend to ride the Hogwarts Express, the new Harry Potter themed transportation between the parks. Luckily, you do not have to pay full price as there are many discount deals online including 2 days free when you buy 2. The Hogwarts Express is a new time saving and entertaining way to travel between the 2 parks. It’s hard to imagine now that you used to have to complete the long walk just to get from one to the other! 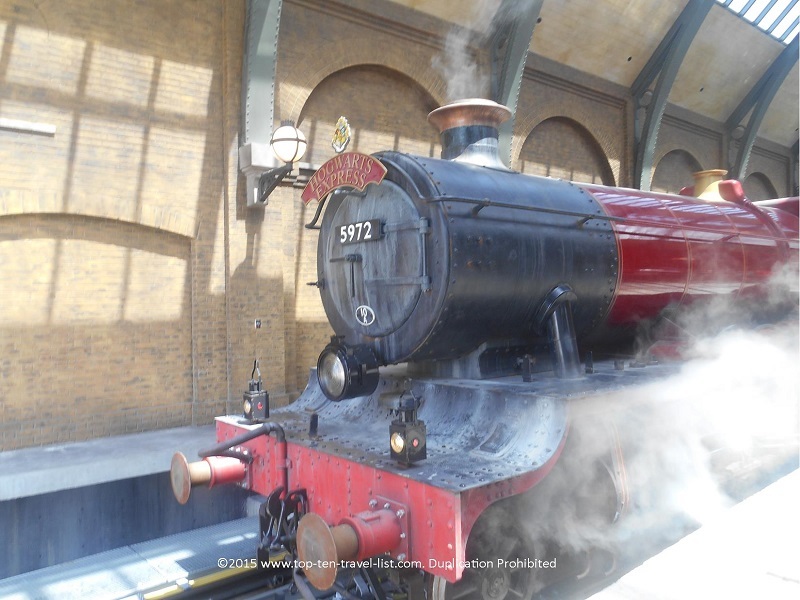 You can board at either the Hogsmeade station (Islands of Adventure) or King’s Cross Station (Universal Studios). Sit back and enjoy the ride as you pass the beautiful English countryside. 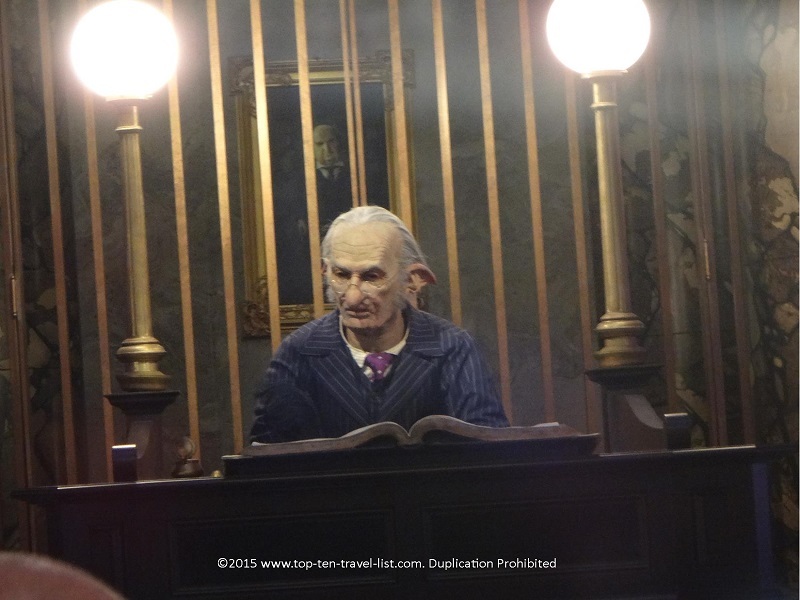 In addition, the 2 major Harry Potter rides and shopping/dining areas (Diagon Alley and Hogsmeade) are located in opposing parks, thus making park to park tickets even more necessary. We arrived at Universal right at opening, reaching the ride at about 8:30am. By this time, there was already a 4 hour wait! If you are looking for a short wait time, you should get to this ride as early as possible so you are not wasting your money standing in line all day. Also be sure to pull out your Wait Times app to see if the wait is worth your time. In the morning hours, most rides have really short wait times (especially when everyone is running to get in line for Harry Potter). Is it worth it to lose hours of your time for 1 ride or would you rather get on several during this time? The choice is up to you! Another option is to stay at an on site Universal hotel which includes an hour early admission to the Wizarding World of Harry Potter. Other popular rides that you should consider earlier in the day include Despicable Me: Minion Mayhem, Hollywood Rip Ride RockIt, The Incredible Hulk Coaster, and Harry Potter and the Forbidden Journey. All of these rides will be insanely busy later in the afternoon, so it would be smart to try to get on 1 or 2 earlier in the morning when the park is less crowded. Check out the crowds in Diagon Alley. Early admission will allow you to enjoy the park before opening. A handful of Universal’s onsite hotels like Hard Rock Hotel offer special perks such as a 1 hour early admission to The Wizarding World of Harry Potter. This is a great way to experience the parks before they get too packed. There is so much to experience, especially with the new Diagon Alley shops; any hotel offering extra time at the park is definitely worth checking into! You could easily spend an entire day just exploring the Harry Potter sections of the park, and with the incredible attention to detail and beautiful design, any Harry Potter fan will want to do so! On a side note, anyone that doesn’t like Harry Potter will be in luck as much of the traffic is now centered around this new area of the park, meaning lower wait times for the rest of the rides! After your print out your tickets at home, you will see a separate print out for a coupon savings booklet ticket. You can present this ticket at the Islands Trading Company at Islands of Adventure or the Universal Studios Store at Universal Studios for a special savings booklet. Here you will find valuable coupons for park shops and restaurants. Any savings helps right? You might as well browse through the coupon booklet if you intend on dining and shopping within the park anyways. 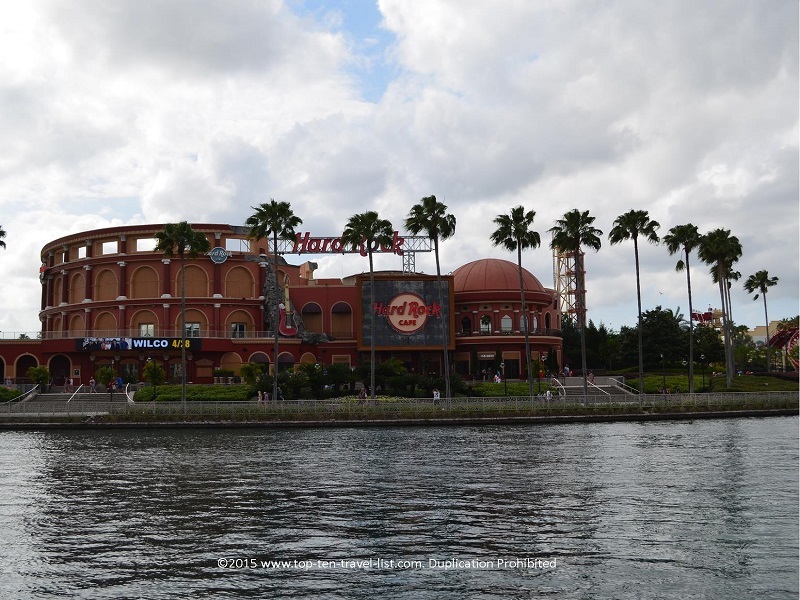 Hard Rock Cafe, a great choice at City Walk, is one of the many valuable coupons you will find. It’s quite expensive, however, I really love this restaurant and make a point of stopping by on any vacation. Try the Jumbo platter – it’s amazing! Many hotels offer free, convenient shuttles to the parks. This saves you not only time, but also the high costs associated with renting a car (price per day of car, gas, etc.) and paying hefty parking fees ($17 per vehicle). In addition, many Universal Partner hotels are located within walking distance (Doubletree, Hyatt Place, & Holiday Inn & Suites). Doubletree Hotel at the Entrance to Universal Studios, the closest hotel to the park, is a fantastic option. Not only is it located only a half mile away, but you can also book a room with fabulous views of the park! Other amenities include 2 pools, several restaurants, cookies at check in, and an on-site Starbucks. You really can’t beat the amenities for the price. I recommend a full bottle to split amongst everyone in your party. The sun is intense and there really isn’t much shade, with some ride wait lines being directly in the sun, so lather up or you might be lying in bed the next instead of having fun at the park! My sunblock of choice is Coppertone Water Babies SPF 50 – I’ve never had a burn from it and it is rated pretty good in terms of EWG’s list of safer sunscreens. Sunglasses are a lifesaver when walking around the sunny park all day. As an added bonus, they prevent you from having that squinty eye look in all your photos! I recommend picking up a cheap pair at a Walmart or dollar store that way it doesn’t really matter if they break or get lost. As long as they block the sun, who cares how much they cost! This isn’t a fashion show; you are the parks to have a good time! Trust me, they all work the same and if anything, all my cheap sunglasses happen to be the ones that I still have ten years later ;). After 10 hours at the park, I was more than ready to ditch the contacts and change into eyeglasses to give my sore, tired eyes a much needed break. You may also want to bring an extra pair of disposable contacts just in case they get foggy or you lose one during a water ride. I recommend Acuvue 1 Day Moist as they are comfortable and usually last me the entire day without getting too bothersome. It can get really, really hot standing still for hours at a time waiting in various ride lines. 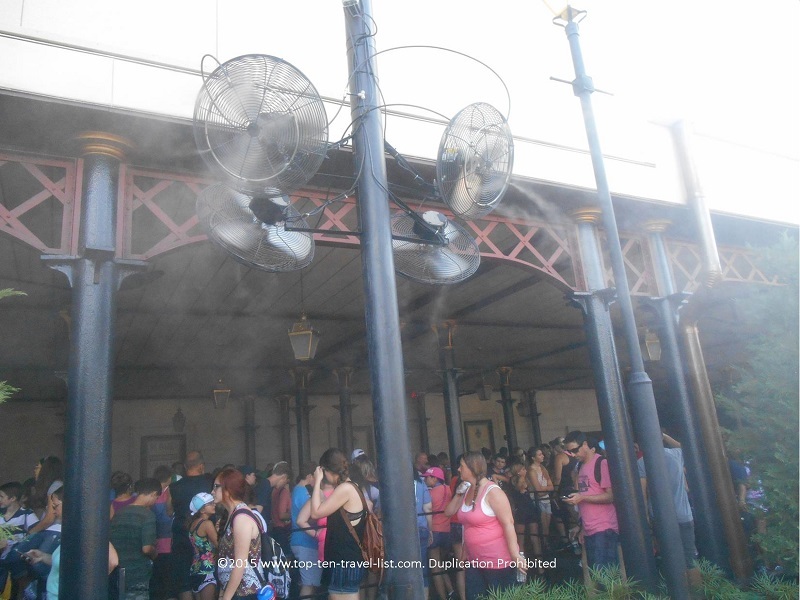 Even though there are several large misters spread throughout the park, a personal fan mister works much better, not to mention is available on an as needed basis. A miserably hot 3 hour plus wait for the new Harry Potter ride. It can get really, really hot standing in one of these congested lines.